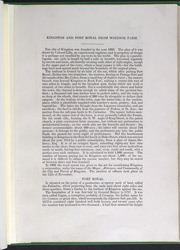 Accompanying text for a plate depicting Kingston and Port Royal. This text has been taken from James Hakewill's 'A Picturesque Tour in the Island of Jamaica.' Port Royal was an important trading centre for the Spanish in the 17th century and home to the notorious buccaneers. The town was devastated by an earthquake in 1692, a fire in 1703 and a hurricane in 1722. It was therefore eventually abandoned and Kingston founded to replace it. Kingston took over from St Jago de la Vega (Spanish Town) as the island's capital in 1872. Kingston was designed by Colonel Lilly and was created in the form of a parallelogram one mile in length and half a mile in width, with the streets crossing one another at right angles.